St. Marys’ Jill Schmitmeyer, left, and Lauren Cisco pressure Shawnee’s Alissa Stahler during a Division II tournament game in Spencerville. See more tourney photos at LimaScores.com. Van Wert’s Abby Jackson pulls down a rebound during a Division II tournament game in Spencerville. SPENCERVILLE — Neither team was able to blister the nets. But St. Marys’ defense was consistent the whole way. St. Marys forced 25 Shawnee turnovers to help the Roughriders post a 38-34 victory over Shawnee in the Division II girls basketball sectional opener Tuesday night. Elida won the second sectional game of the night over Van Wert, 61-44. It marked the final game for longtime Shawnee coach Jeff Heistan, who had earlier given his notice at the end of the year. St. Marys’ Syd Cisco and Lauren Cisco combined for a key steal at the 3-point line in the final 25 seconds with the game tied at 34. Lauren Cisco converted the steal into a fast-break layup to give St. Marys the lead to stay 36-34 with 20 seconds to go. Shawnee missed a 3-point attempt at the other end and Syd Cisco grabbed the rebound and was fouled. Syd Cisco’s two foul shots with 3.5 seconds left finished the game at 38-34. Shawnee’s Alissa Stahler finished with 17 points and 14 rebounds. She fouled out with 2:32 to go and St. Marys holding a 33-31 lead. Eliyana Floyd had eight points and six rebounds for Shawnee. Makenna Mele had 13 points and seven rebounds for St. Marys. Syd Cisco had 11 points, while Lauren Cisco had six points and six rebounds. Jill Schmitmeyer added six points and seven rebounds. St. Marys’ Aliya Patterson did a good job on defense in the second half with Stahler. 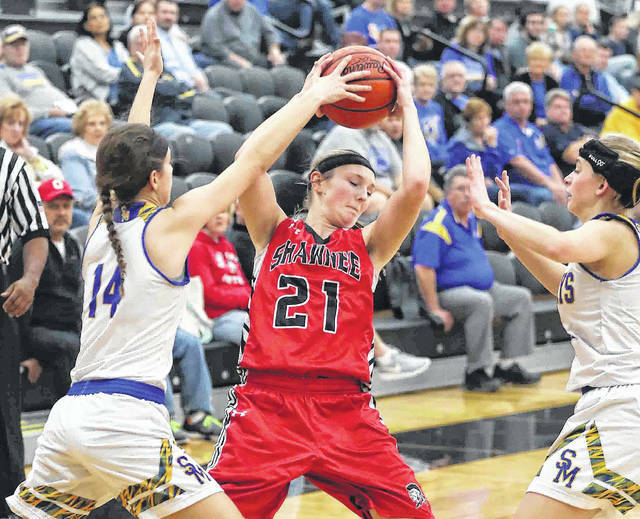 She held Stahler to six points in the second half. “Aliya Patterson is our defensive specialist and she’s been hurt this year, but when she’s been here, she’s been a threat for us, defensively,” Burke said. Shawnee played without its starting center 6-foot-1 sophomore Trinity Gearing, who was out with an ankle injury. Shawnee led 7-5 after the first quarter. It was tied at 17 at the half. Stahler was pacing the Indians with dribble drives and pull-up jumpers. She had 11 at the half. The Indians’ problem was turnovers. They had 14 at the break. St. Marys struggled to capitalize on the turnovers, hitting just 1 of 13 from the field in the opening quarter. For the game, Shawnee had 25 turnovers. St. Marys had 13. Shawnee shot 29 percent from the field and was 2 of 15 on 3-pointers. St. Marys shot 28 percent from the field and was 1 of 8 on 3-pointers. Shawnee won the boards, 40-28. St. Marys will play second-seeded Bath at 6 p.m. Saturday in Spencerville. Elida used a fast-break attack to pull away from Van Wert and notch a victory in the second Division II sectional opener of the night at Spencerville. Shyah Wheeler led the Bulldogs with 23 points. Amiah Jones added 15 points. Hayleigh Bacome had 11 points for Elida. Reagan Priest had 15 points for Van Wert. 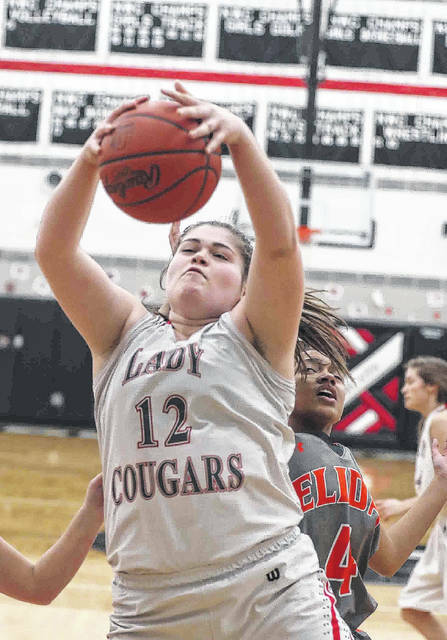 Caylee Phillips had 13. Elida (7-16) advances to meet No.1-seed Defiance (18-4) in the sectional finals at 8 p.m. Saturday at Spencerville. Van Wert ends its year 8-15. Elida led 19-10 after the first quarter and 33-15 at the half. The Bulldogs got most of their second-half baskets in transition and led 48-28 after three. This entry was tagged Elida, shawnee, stmarys, vanwert. Bookmark the permalink.